Bottle sleeve coolies offer a non-slip grip and is great for the water activities, picnics, parties, and much more. 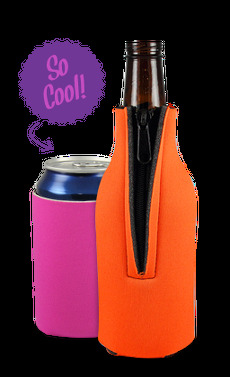 Other ideal uses for this bottle sleeve koozie includes promotional campaigns, charitable giveaways, and brand name recognition events. Customized to your taste, this bottle coolie will impress others with your original design or business logo imprinted. This bottle sleeve is designed for long-neck bottled beverages and made with high-quality, 1/8" thick, open cell foam. Very Satisfied. Shape was consistent. Minimal bad edges.